Always lookin’ for an excuse to eat dessert? Meee toooooo! The day after Thanksgiving, I find nothing wrong with pulling the leftover pumpkin pie out of the fridge for breakfast. It’s got fiber, Vitamin A, B, E, and C. That’s a lot of letters. So yes, thank you, I’ll have another piece. And why not add a dollop of whip cream calcium on top? 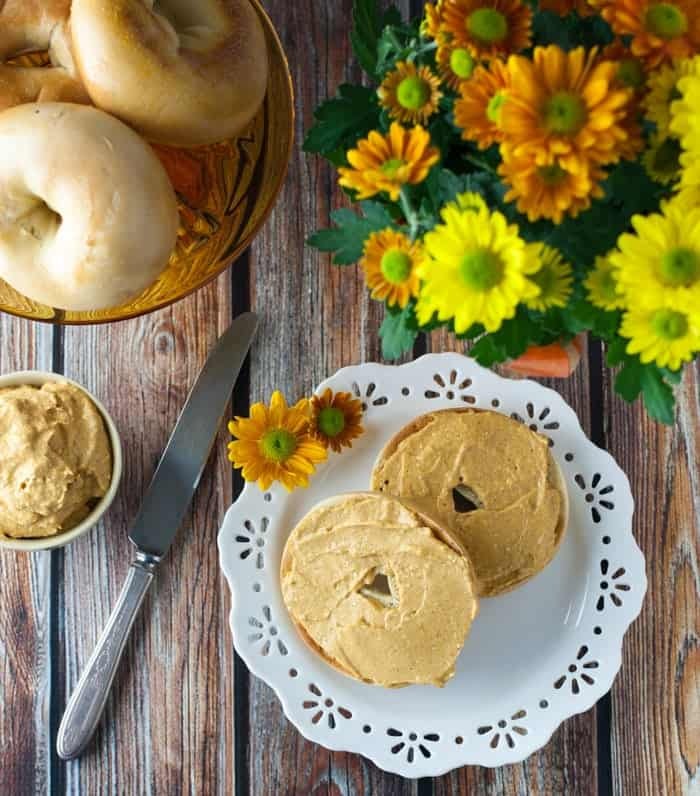 With this pumpkin cream cheese spread, you’ll get the benefits of these important nutrients, but you’ll also get to taste the flavors of pumpkin pie in all its glory. And if we make this ahead of time, we’ll be saving ourselves from slaving over a big breakfast on the biggest cooking day of the year. I’m high-fiving myself. Are you high-fiving yourself? Cuz just I’ve saved us time AND vitamin deficiency. See how my mind works? Mischievous, but smart. 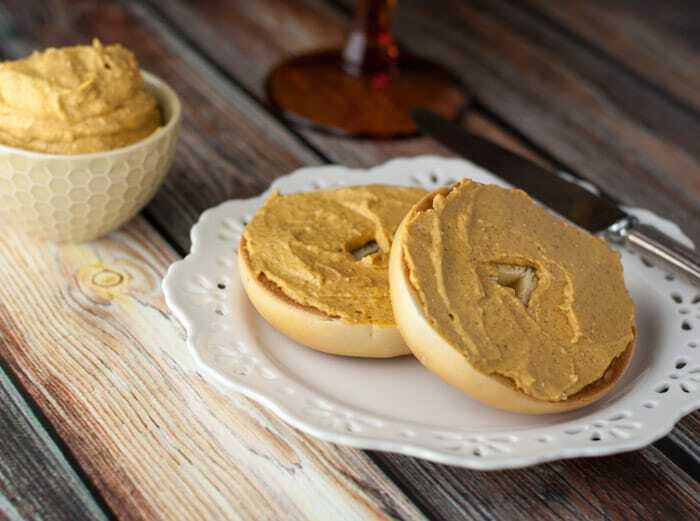 This pumpkin cream cheese spread tastes like it’s chock full of desserty evil goodness. We need this. Spread it on a fresh bagel, and it’ll hold you until turkey time. I was eating this by the spoonful and, damnit, I’m proud of it. This is no time to skimp on flavor. It’s Thanksgiving! We’re going to eat like we mean it, savor every bite, and be thankful for all that we have. 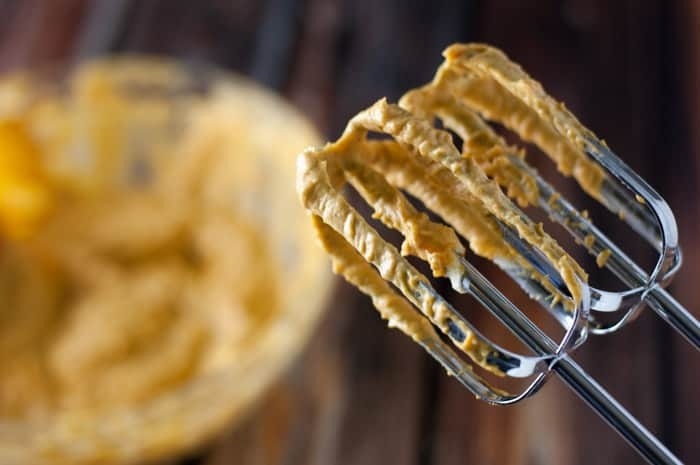 Especially this creamy, cheesy, pumpkin cream cheese spread. Thank you, pumpkins! This recipe is so easy to make and just takes minutes. Ya’ll, it’s spreadable pumpkin pie! It has all the good spicy cinnamon and ginger flavors you’d expect from pumpkin cream cheese. This is a perfect recipe for Christmas morning breakfast, too! Who has time to make breakfast? …and cut to: Christmas morning and the kids are ripping through those presents like mini godzillas on crack. In 5 minutes they’re done, leaving a gigantic mess behind and you’ve got to be at Grandma Lucy’s house in an hour. You’re going to need some fuel. Some pumpkin fuel. 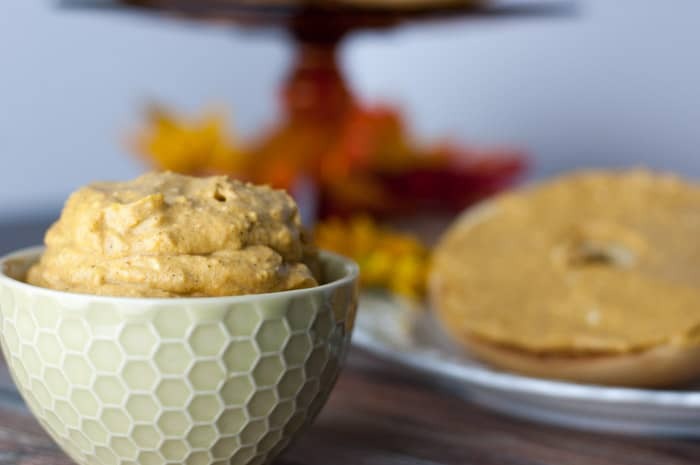 Kids will love this Pumpkin Pie Cream Cheese Spread! I made a mild version and a spicy version (but not too spicy). Pick your favorite! In medium bowl, combine all ingredients and mix with an electric mixer for 30 seconds on low speed, and an additional 2 minutes on medium speed or until fully combined and whipped. Spread on toasted bagels, bread, or serve with pita chips. 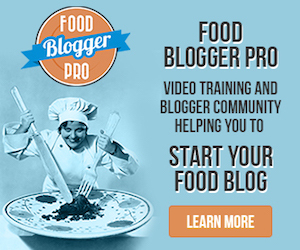 Looking for more pumpkin or holiday recipes to try? of your best. I think I will make this for my family this holiday! Thanks! Thanks, Gardengirl! Hope your holiday is wonderful. 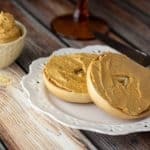 Enjoy the Pumpkin Cream Cheese Spread!